Arianna just loves saying her name. She thinks it is so pretty, and it gives her a lot of confidence. Arianna needs confidence because, you see, deep down Arianna wants to compete in a snail pageant. So she has been practicing walking down the runway. She always holds her head up and keeps her shell very straight. Good posture is so important, you know, especially for beauty queens. Arianna was crocheted with 100% acrylic yarn and stuffed with polyester fiberfill. 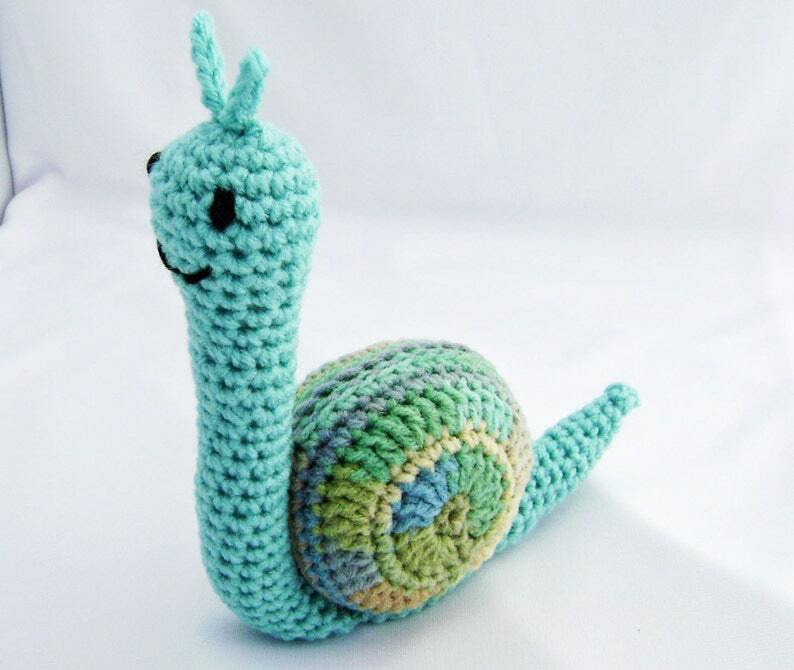 Her shell is made with a variegated yarn in pastel shades of aqua, pale greens, pale blues and beige. Her body is a lovely shade of solid aqua. Her eyes and mouth were embroidered with black yarn. Arianna is about 7 ¾ inches (19.7 cm) tall to the top of her antenna, 7 ¾ inches(19.7 cm) long to the tip of her tail, and 2 ¼ inches (5.7 cm) wide. Arianna was designed and crocheted by me, in a smoke free, dog loving home. Care instructions: Like most of my critters, Arianna is machine washable on delicate, using a pillowcase or hosiery bag. She can be machine dried on low or just re-shaped and allowed to air-dry.